Yeah well, I've just played the game a little bit with my BF on his house before I go to work and...damn! buddys, the wait will be so, so long! If the game releases in early or mid 2019 I could wait for it, but if not...I suppose I'll get a console the very next time they're on sale. Destin Legarie's "crazy" statement... is that they won't release RDR2 on PC because they didn't release RDR1 on PC? That's probably the most nosense speculation bout' the RDR2 not be releasing on PC.Theres a LOT of exemples of games that were console exclusives and now we can play on PC,Metal Gear Solid is one of them. Yeah I don't understand why so many people like to repeat this, because not only RDR1 not coming to PC has absolutely zero influence on what platforms RDR2 will release to, but also because literally everything else points to this game coming to PC. Right now we're in the age of long-time, traditionally console-centric franchises making their way to PC, a lot of them with huge success. Yakuza and Soul Calibur haven't touched the PC platform since their original creation, and both of these franchises are very old. Metal Gear was also well on its way towards becoming a mainstay on PC with MGR and MGSV, but Konami f*cked us all out of Metal Gear on ANY platform, in the end. We also have some Sony games that are occasionally greenlit for PC release, such as Nioh. It's old. Just in case anyone didn't catch it though. Very important indeed... I hope that if they're making us waiting for the game, they release the "full" version of RDR 2 on PC, with the servers of RDO ready to just log in and play, like the PC Version of GTA V with the Heist Update and all the previous updates. However, I'm kinda fed up with R*'s policy of torturing PC players with the usual, systematic, long long wait as if they're doing us a favor and don't need the money. It is getting ridiculous. Most normal publishers launch all versions including PC, together on a single release date. If this wait is hard ( and already is, honestly ) wait and see how bad it'll be with GTA 6...anyway, most probably an official announcement would come within 6 months as of today, followed by another 6 months of waiting until RDR2 PC is finally out, and that is the good case scenario. It's frustrating, yeah. Rockstar is pretty much the only company that gets away with this sh*t. They haven't really been catching flak from people over anything until very recently, with GTAO monetization and treating employees like dirt (the latter isn't really recent, but still). I miss the fluke that was Max Payne 3's PC release... a mere week of wait. Imagine that. I’ve just bought it for the Xbox but still believe it will come to the PC, my primary platform. Maybe I’m just the kind of muppet R* loves to fleece. But since GTA IV I’ve had so many hours of enjoyment from their games buying it twice is trivial. One copy is the cost of a night out in a London. given the negative experience R* has had with PC hackers screwing them over in GTAO, my outlook is pessimistic. Particularly since they had to waste money in court fees taking a certain set of black hat modders to court over a cancerous mod menu. And especially since they didn't bother with a PC port for RDR. That being said, it would be a huge loss if they didn't port RDR2 to PC. Because the soul of what made GTA SA great from an RP perspective apparently has returned with this franchise. Arthur can get fat from lack of exercise, be malnourished or a mini Schwartznegger based on his activities. He can grow a beard/mustache for personal/socialization/style purposes. Or to disguise himself if he's a wanted criminal over several counties. Or he can go clean shaven and/or cut his hair short. He's got a wide variety of clothing to select from if he's got the cash. And the clothing is 100% functional, giving him warmth and other core/perk bonuses. Same for his horse. etc etc. LIst of amazing things R* managed to accomplish in designing the RP and immersion for this game is too long. Now just imagine how mind blowing all of this vanilla content could become with PC mods. Especially if improved by some of the most popular mods used in Skyrim/Fallout? I'm really hoping and praying they do port it to the PC. I wouldn't hesitate to buy the game all over again for that golden opportunity to customize the game. The visuals and gameplay so far is incredible. Pessimism isn't realism, though. Just like optimism. The realistic take in this situation would lean more towards the PC version being all but a certainty. Not because of wishful thinking, but because of near-past dictating near-future. The first RDR was 8 years ago. Under a very different Rockstar, during a very different time for their engine, teams and the (PC) gaming landscape as a whole. Every single Rockstar game after Red Dead Redemption 1, from LA Noire to GTA V, has made its way to PC. I was even surprised they decided to port LA Noire, since I really do not remember as big of an outcry for that game to hit PC, at least compared to Red Dead. I think it's just common sense at this point. They put in a lot of effort into laying the groundwork for future games on PC. We know this because of the light that was shed on the way Rockstar works on PC games, this was thanks to the various previews and interviews that were published at around GTA V's PC release. This is an especially interesting bit. Gives insight into how they've been handling PC as of late. My prediction would be one year later, no longer. Maybe along with big dlc to make people interested again? Hey, no worries. 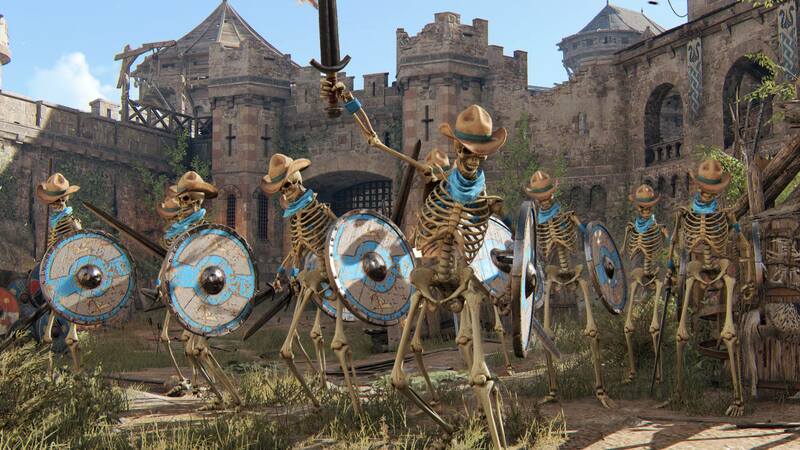 For Honor has us covered with Undead Nightmare 2! I have some interesting information taken from the RDR2 Companion App. Android apps are usually compiled with Debug Symbols embedded to the libs and elfs. So, I have found game parameters and even game functions inside the app. What sort of compiler is this? PARAM_Oculus - Maybe it's there because of LA Noire VR, maybe the PC Version will feature Oculus Rift and general VR support. PARAM_companionAutoConnectIpPC - I think this confirms it. PARAM_highColorPrecision - Wide Gamut perhaps? Is there a PC Version of this Companion App? Wow, nice work! This is pretty big. Not that it's a surprise, in fact I know Rockstar has a PC version running internally (don't ask), but these are nice findings. Also, ADPCM is the audio format they use on PC. It's not great. Now I gotta ask though! What's so bad about the format? I've never heard of it before. It's OLD, it's very light on the CPU side which is why a lot of developers continue to use it to this day, but in the past it was mainly to save space, a feature which more modern codecs can do better AND sound better. The downside of ADPCM is that is often sounds "harsh" and compresses a lot of the dynamics of the mix. 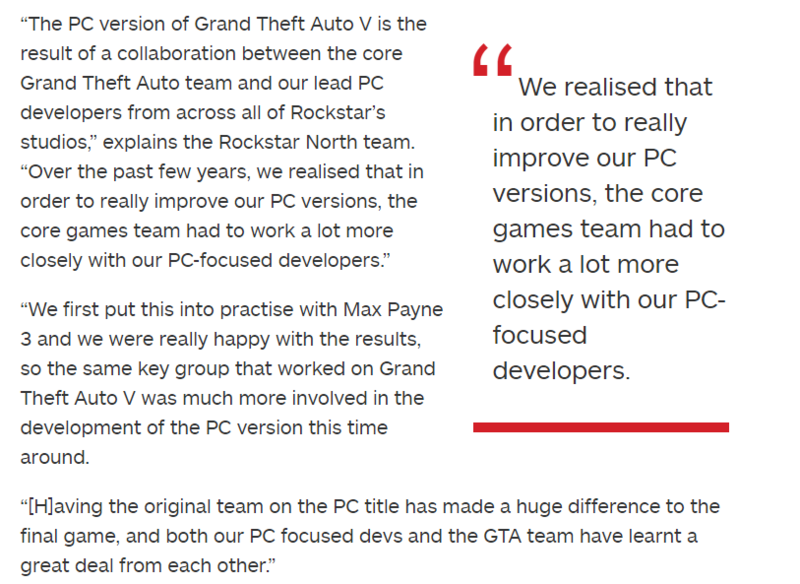 edit: But to be clear, it's a format Rockstar have stuck with for years, it's used in GTA IV, Max Payne 3, GTAV, etc on PC. PS3 and PS4 use MP3 (which ironically comes out sounding the best) and Xbox 360/Xbox One uses a variation of WMA called XMA. Bummer. I'm gonna start listening for it now every time I launch GTA. To summarize, I made up my own list of what I think will be the graphical settings if this really comes from RDR2 PC code. It's not THAT noticeable to most people, I did examples of it HERE one from the PC version, one from the PS4 version and one which was my attempt using OGG-Vorbis (a format they used for San Andreas PC back in 2005). These are most definitely new and definitely for RDR2. They are really just holding on to a PC version without releasing it. They are really just holding on to a PC version without releasing it. These could be for the consoles as they're both AMD based but still interesting. Though it could be related to the Xbox One.